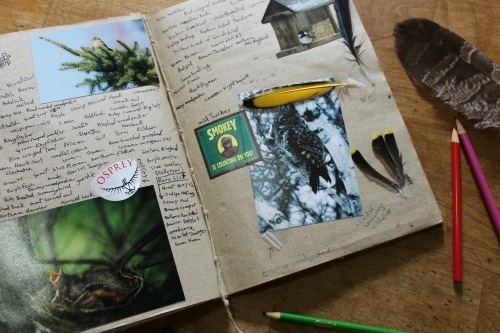 It's difficult for most homeschooling skeptics to think outside the traditional classroom box. Unconventional methods frighten them. That's understandable, I suppose. A person can't truly comprehend that which he has never experienced. 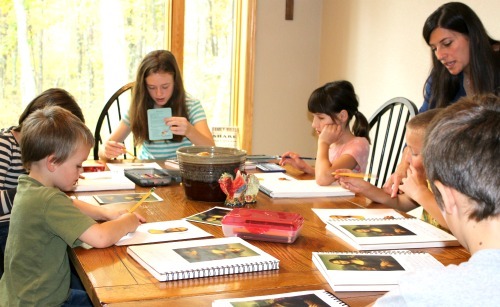 So, many regular folks assume that homeschool is suppose to look like school...only at home. Sadly, many homeschoolers think that too. But, you can't just replace desks with dining room tables and expect the end result to be dramatically different. No. Homeschooling is not school at home. It is an entirely different animal altogether and should therefore look vastly different. In its daily liturgy. In its focus. In its very DNA. I had a conversation with an extended relative recently. She drilled me on the quirks and oddities of home education. She was not interrogating. She was just curious. When I mentioned that I don't give my kids curriculum tests, she paused. "Not even weekly spelling test?" came her reply. "Nope, not even spelling tests." I said. "They're just not necessary." "But, how will you know if they know how to spell?" she questioned. "Spelling tests don't show you whether or not a child can spell. They only show you whether a child can regurgitate a handful of words you've given him to memorize." That was the short answer. I only teach five kids. Taking tests are just one of a lengthy list of school "skills" that help herd the crowd, like writing those dreaded book reports, standing in lines in the hallway, and asking permission to go to the bathroom. I don't have a "crowd," and so I don't need to herd. It's virtually impossible for one traditional classroom teacher with thirty to forty kids to truly assess whether one of those children has mastered all of his twenty weekly spelling words or if he knows all five steps to the long division process unless she uses some kind of black-and-white assessment tool...a test. With a test, she can see at a glance, what each child knows and what he lacks. She can get an accurate picture of how a child's knowledge stacks up against that of his peers, and have a concrete/unbiased report of progress with which to show parents. How else would she be able to clearly articulate a child's progress? But as a homeschool mom, I sit right next to my kids each day. Much of my teaching is done one-on-one. I can see with my own two eyes whether my son has mastered long division or if my daughter can spell "ominous" correctly. I don't have to report progress to a district. I don't have to prove mastery to anyone but myself. A test would be a redundant display of what I already know. Tests only measure. They don't teach. A test is a simple assessment. Nothing more. A test does not teach material. It merely shows what has been taught vs. what has actually been learned. Take an average spelling test, for example. The point of a spelling test is to show how many words a child has memorized in comparison to the number of words that were taught that week. Typically, the test is administered. The test is graded, recorded, and handed back to the child. And a new set of words are taught the following week. But isn't the point of a spelling "class" to teach spelling. If a child misses five words on his test, but is then immediately pushed onto the next week's word list, he never actually learns to spell those five words. What then is the point of spelling class? In my homeschool, I don't teach spelling words in order that my children can pass a test. I teach spelling skills so that they can each become good spellers. So, I don't waste my time giving tests. A spelling "class" dedicated to a spelling test is just a wasted opportunity. I'd much rather spend that time teaching them to actually spell. Tests give a two-dimensional view. A few weeks ago while administering the annual achievement tests that are mandated by my state, I noticed that my second grader marked a very simple social studies question wrong. The question asked, "Which picture shows the correct way to eat soup?" The corresponding answers showed a picture of a child using his mouth to slurp the soup right out of the bowl, a child using a fork to eat the soup, and a child using a spoon to eat the soup. My son selected the picture showing the child with the fork. Not wanting to tamper with the results of the test, but curious to know his reasoning, I asked him why he marked that particular answer as he did. "Because the soup in the bowl has lots of noodles in it, Mom. And remember last week you made that really noodle-y Japanese soup? Remember how you said I could eat it with a fork if I wanted to because I couldn't keep the noodles on my spoon? I just thought it would be easier for the boy in the picture to eat his soup if his mom let him use a fork too." And of course, he was right. But unfortunately, he was also wrong. My son chose the picture with the fork and obviously got the question incorrect. But, if we're all being honest, Japanese noodle soup would be easier to eat with a fork. You see, tests only allow for one prescribed answer. And sometimes, there's more than one right way. I'd much rather celebrate my outside of the box, problem solving kid than encourage him to force his square self into someone else's round hole. An "A" on a test doesn't show mastery of anything beyond the fifty questions on that particular test. And what's even more noteworthy, a black-and-white test can't assess the most important things in life like courage, empathy, determination, ingenuity, character, effort, kindness, or even intelligence. Tests are traditional and don't play nicely with my unconventional approach. As an eclectic homeschooler, I use some traditional curriculums like my most favorite of all math programs. But more often than not, I merge them together with living books, hands-on unit studies, delight-directed learning, and others to create a tailor-made learning experience for each of my kids. Admittedly, these methods and resources don't surrender well to a test. They're often too ambiguous and emphasize the "wrong" things. Case in point, the WHO and WHEN crammed into a short excerpt of the life of George Washington in a dry-as-dust textbook is just perfect fodder for a test. (Perhaps that explains my childhood disdain of all-things-history. I learned early on that names and dates don't provide much color for the imagination.) But the WHAT and WHY of those same stories found in intriguing biographies like George vs. George or George Washington's Teeth are not as easy to maneuver onto a test sheet. The rote memorization of dry facts and statistics have their place. But, who among us can actually remember when Washington took office? Probably only dedicated historical re-enactors and tweed-coat clad history professors. But, I bet we can all recall why he rose to power in the first place. Those are the stories that I want my kids to know. The WHAT and WHY...those are the facts that textbooks don't always emphasize. Those are the theories and big conversations that don't play nicely with traditional testing methods. There will be plenty of time for tests someday. Other than the required annual state achievement test that they take each spring, my elementary-aged kids never have to slough through tests. Not ever. As I've mentioned, there's just no point. However come eighth grade, my kids will each begin taking curriculum driven tests -- for one reason and one reason only. Practice. 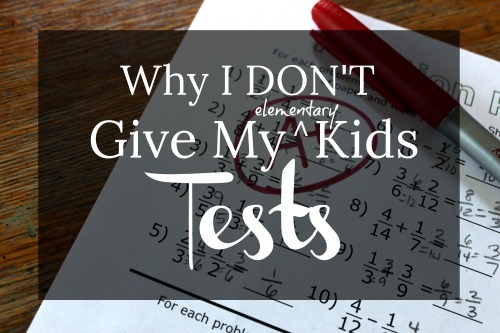 I want them to have one solid year of test-taking practice under their belts before they have to start taking tests for grades. While I can't assume that all of my kids will go to college someday, I want to ensure that they can if they want to. In order to do that as a homeschooler, they will each have to have an accurate high school transcript and do well on the SAT or ACT. In addition, we live in a state that grants free dual enrollment for high school juniors and seniors. Eleventh and twelfth graders can take college courses (in a college classroom or online) for both high school and college credit without paying one dime. Once each of my kids enter these dual enrollment classes, tests are inevitable. I'd much rather give them a soft start to test-taking here at home in the eighth grade in order that they can continue to build on those skills through the latter years of high school. This will not only make it much easier for me to award provable grade point averages, but will also give them some much-needed practice at test taking skills. My job as a homeschool mom is to prepare my kids for all kinds of life scenarios. Test taking is one of them. I'd rather my children learn proper test taking skills in the safety of my homeschool than in the career-altering trenches of the SATs or worse yet, the college classroom. Tests have their place in society. There's no getting around that. But do they belong in a homeschool? That's a question for the ages, I suppose. I can only answer for my home and for my school. "If the purpose for learning is to score well on a test, we've lost sight of the real reason for learning." Amen. We don't do tests at our house either. Though now my high schoolers are testing via online courses and practicing for SAT/ACT exams. They're doing fine--quite well, in fact--and they did not grow up taking tests at all. That's awesome to read and just affirms all of my long held beliefs. Thank you for sharing. I agree with you 100%! 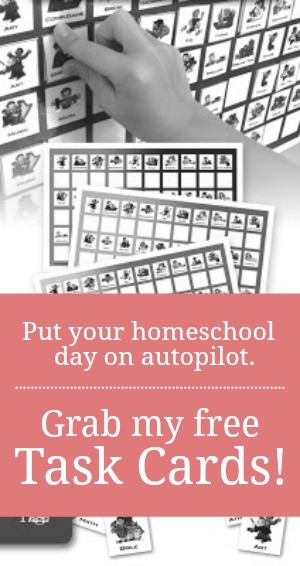 And, by the way, I am also a classroom teacher turned homeschool mom! Me too! Funny how many of us there are. That should be a big indicator of a broken system. As a high school unschooler, I disagree that they need to learn how to take tests before college. I know lots of kids who grew up without any tests at all except for possibly the SAT or ACT who have gone on to college just fine. So you may want to rethink your reasoning there. I agree with everything else, though! Stupid mandated annual testing is a huge waste of time for most homeschoolers. Even with 7 kids in my home, I know what they know & don't know. It's not rocket science. I guess we'll have to agree to disagree here, Sara. Since my husband was homeschooled, I, too, know lots of grown adults who were homeschooled and one of the things I hear most often from them is how they wish they would have had a few more school skills like tests to prepare them for college. They did fine, yes. But almost all of them say they suffered with test anxiety and would have liked to have had black-and-white feedback for how they were doing. College was a bit overwhelming in that regard. As a mom, I don't ever want to intentionally put my kids in a position to feel unprepared for something. My husband was homeschooled. I went to public school (K-12) on the other side of the globe. I took more tests than I can remember. We are homeschooling our kids. My husband and I both teach at college level. I would not want to have my kids grown up taking numerous tests like I did, but I do want to train them up knowing how to take tests. Knowing the materials and knowing how to take a test well are different. My husband and I have seen good students who could have gone to a better grad school should they have better GPA and test score in the GRE. Test skills aren't developed in one year, in my opinion. And until our education system changes how it assesses a student with different means, testing skill is a skill that needs to be developed, slowly, through the years. Of course, teaching solely for the test isn't true education. But ignoring tests altogether isn't preparing the kids well, either. Well said! It's like you read my own thoughts on this subject! Your post is a good reminder that I'm not on an island with my perspective on tests. I have a soon-to-be 8th grader as well and the only testing we've done is the annual achievement test. But this year that will start to change as we prepare her for high school and beyond. Thank you for another great post! 8th grade is a great year to start introducing tests gently. Glad this post resonated with you. Happy homeschooling! Dear Jamie!I started homeschooling about 1,5 years ago.I don't give for her (8,5y) tests either, except what's into the Math u see.Good to hear that, I don't have to give her tests. I took her out from 2nd grade,but sometimes I'm worried as others saying if someone not educated well (diploma,etc) will fail in homeschooling. Or homeschooled kids doesn't learn to solve the problems different ways (logic).Or not going to be socialized well ( manners, building friendship, handling bully ), doesn't know test skills. Math skills: I teaching her European ways to count, for me the how she learned into the school is complicated and takes more time.And I hope this type of counting execptable here. ^we start here at the bottom,if bottom number grater than on the top, than the top number will be always over the 10.In this case,"how much do u add to the 9 to get 12.And the leftover going to be added to the next bottom number,&starts again,"how much do u add to the 4 to get 5? "That simple it is.We not grouping numbers & starting after to solve the problem. I read your other writing, "All about spelling". I want to ask, whats your recommendation for spelling/reading.Good spelling skills makes better readers.I have already the "Teach your child to read in 100 easy lessons".If this not that good, than I buy the All about spelling package. Thank you your answer! I need to learn allot to be a successful homeschooling mom.